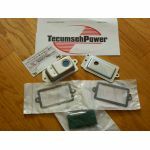 Looking For Tecumseh parts? You came to the right place, we are one of the few online parts dealers who maintains a supply of both antique and current engine parts from the 50's right up until the last engine model made in 2008. Parts are still readily available for most engines, many parts which are still being made in the USA including Carburetors. Although Tecumseh has stopped making engines parts support still continues from the factory! If you dont see what you need listed contact us. 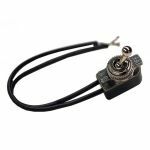 Toggle Switch / On / Off Switch with 2, 6" Wire Leads. Used on GoKarts. Universal Application. 631927 GENUINE Tecumseh carburetor w/fuel line Toro 524/724 snowblower H50 / H60 NOT CHINESE CRAP! 34553 NOS TEcumseh engine Piston & Rings +.010 40012 ***MISSING PIN & CLIPS ** HM80 ect NLA part ! GENUINE TECUMSEH Spark plug boot cover 27276 H25,H30,ECV,AV520 ect.